I took this photo in Prague more than a decade ago. It remains one of my favorite shots ever. I remember vividly taking this shot. 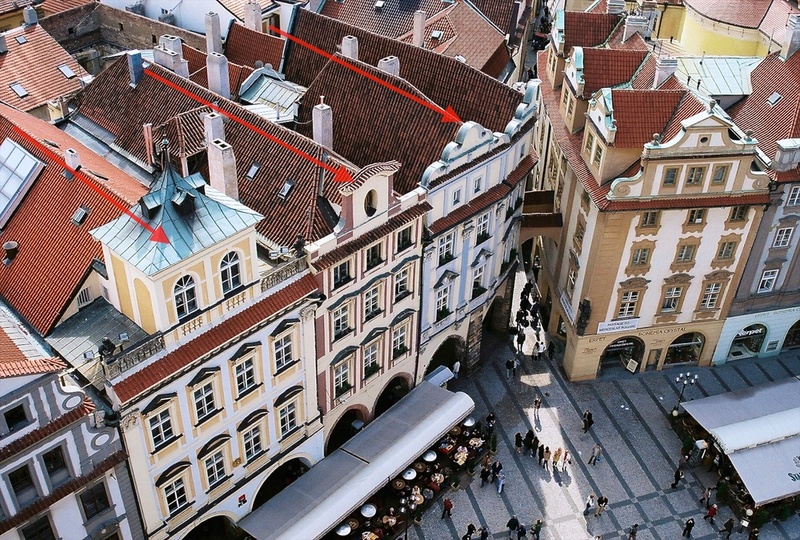 There's a clock tower above the main square of Prague with a small observation deck. I was crammed in there with a bunch of other people. I pointed the camera at the square below. Click. Grab one more frame. Click. That was it. I didn't know much about photography back then. I was flat out auto-mode most of the time, occasionally venturing into the cartoon modes on the camera. I didn't know about rules of composition, leading lines, the rule of thirds, aperture, exposure – anything. I just knew I liked the result. It's what I call a "blind squirrel" shot – even a blind squirrel finds a nut now and again. A clear subject. There aren't any distracting elements. It's immediately clear this is a photo of a European city. And with people in the shot, it has a sense of scale. An interesting perspective. The view point is not typically what we see when walking through a city. It's elevated, but not too high up. It has that on-high feeling, yet maintains an intimate relationship with the city below. Lines, lines, lines! There are great leading lines all over this photo. All of them converge on the lit alley way (which also happens to be off center, another plus). The building facades form leading lines, the rooftops do the same with an interesting intersection with the facades (good tension). The alleyway, the shaft of light, the pattern in the cobblestone, the covered alfresco restaurants. I'd love to say it was planned. The farthest thing from the truth with this photo. The next time you see a photo you like – yours or another photographer's – ask yourself "Why do I like this photo?" Is it an intriguing subject? A balanced composition? The perspective or angle? How it's processed? Keep doing this again and again and again. On a shoot in the not too distant future, you'll find the bits of knowledge you've internalized start to show up in your shots. And you might just learn a thing or two about yourself along the way.